President Obama on Monday banned the federal provision of some types of military-style equipment to local police departments and sharply restricted the availability of others. The ban is part of Mr. Obama’s push to ease tensions between law enforcement and minority communities in reaction to the crises in Baltimore; Ferguson, Mo. ; and other cities. 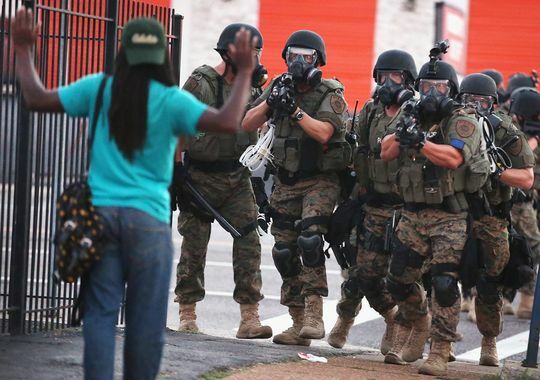 The report from the task force on military equipment cited the police response to the Ferguson unrest as an example of how the “militarization” of police departments can lead to fear and mistrust. In addition to prohibiting some equipment outright, officials said, Mr. Obama accepted the group’s recommendation to impose new restrictions on other military-style items, such as wheeled armored vehicles, pyrotechnics, battering rams and riot gear, and more stringent requirements for training and information collection for departments that acquire them. “The idea is to make sure that we strike a balance in providing the equipment, which is appropriate and useful and important for local law enforcement agencies to keep the community safe, while at the same time putting standards in place,” said Cecilia Muñoz, the director of Mr. Obama’s Domestic Policy Council. The report represents a two-pronged response to a problem that has emerged as a central predicament for Mr. Obama in recent months. He has struggled to acknowledge the sense of fear, grievance and victimization by the police that dominates many minority communities without seeming to forgive violence or condemn law enforcement with a broad brush. In doing so, he is grappling with the limits of his power to force changes in police departments around the country, where practices and procedures are varied and the federal government’s ability to influence change can be minimal. The equipment task force stems from an executive order, and its conclusions affect only the material supplied by the federal government, while the policing recommendations are merely a blueprint for what Mr. Obama would like to see happen in jurisdictions throughout the country. Mr. Obama announced $163 million in grants to encourage police departments to adopt the suggestions. The administration also will launch a “tool kit” for the use of body-worn cameras; the Justice Department created a grant program for law enforcement agencies to purchase them. President Barack Obama announced a ban, effective immediately, on the federal government’s transfer of certain military vehicles and weaponry to local and state police departments in the U.S.
“Through this ban, the president has taken a critical step towards rebuilding trust between police and the people they have pledged to serve. Now, the federal government will no longer be permitted to supply police departments with military weapons and vehicles designed for the battlefield. Grenade launchers, high-caliber weapons, armored vehicles – this equipment never belonged in our neighborhoods. In our report War Comes Home, we detailed the devastating impact of militarized policing, with communities of color hit especially hard by the weapons and tactics of war. This announcement is significant. There are types of objections to how the 1033 Program affects police militarization in America. The first is a practical objection — this equipment was designed for use on the battlefield. There’s just no appropriate domestic application for a tracked tank or for guns that shoot .50-caliber ammunition. The second objection is more about mindset, symbolism and the kind of society in which we want to live. There are plenty of scenarios under which a police department would legitimately need a bulletproof truck. But there’s really no reason why that truck needs to be an MRAP, or painted camouflage or military green, or designed to look as imposing and intimidating as possible. Imagery is important. It’s an indication of how the police see themselves, how they see the community they serve and how the perceive their relationship with that community. And all of that in turn affects how the community views the police. It isn’t difficult to understand how a cop who is dressed in camouflage who rides around the neighborhood in an MRAP is likely to approach to his job with a different mindset than a cop in traditional police blues who conducts daily foot patrols in the same neighborhood. From what has been reported, this new initiative addresses these concerns as well and seems to indicate that the Obama administration understands and appreciates that the symbolic component of police militarization is just as important as the practical component. I’m uncomfortable with any military vehicles going to local police. Free societies tend to draw a clear line between cops and soldiers. Blurring that line indicates a failure to appreciate its importance. But this initiative is moving toward reestablishing that line, not moving it or further blurring it. Federal programs are pretty difficult to disband, so a blanket ban was probably never in the cards. Conditioning the acceptance of this gear on increased transparency, accountability and a move toward community policing seems like a good compromise. We’ll either get less use of this military-issued equipment, or we’ll get more and better information about how it’s used. Either outcome is progress. There’s no understating the role the 1033 Program played in militarizing U.S. police forces. Though it was codified in the 1990s, the transfer policy existed informally dating back to the early 1980s. So reining it in is important. It sends a clear message that the administration really gets this issue. That said, most of the militarization today happens outside the 1033 Program. As the Heritage Foundation reported last year, few of the weapons we saw in those iconic images coming out of Ferguson were obtained through 1033. That program created the thirst for militarization, but police agencies can now quench that thirst elsewhere. Since 2003, for example, the Department of Homeland Security has been giving grants to police departments around the country to purchase new military-grade gear. That program now dwarfs the 1033 Program. It has also given rise to a cottage industry of companies that build gear in exchange for those DHS checks. Those companies now have a significant lobbying presence in Washington. I suspect that presence will now only grow stronger. So if the Obama administration really wants to roll back police militarization, this program needs reform, too. Police agencies also sometimes buy the gear directly from manufacturers. Some purchase gear through donations. In some cases, even individual officers buy their own stuff. There really isn’t much the Obama administration can do about these sources of militarized weapons. Ultimately, I think going after the symbolism component to militarization is more important than attacking the the practical component. Most police departments are always going to have a SWAT team. Larger departments will have several. So the option to use militarized force will always be available. The key is to get them to opt for it only when it’s appropriate. (A good start would be to remove the incentives to use such force when it isn’t.) Or better yet, to instill a healthy reluctance to use such force at all — to make deescalating conflicts the priority instead of overwhelming them. The good news is that this new policy suggests that the Obama administration understands this. But the push will have to come from the bottom up, too. The federal government can stop contributing to the problem, but it will be up to local activists, voters and elected officials to actually change it. There will be resistance, from unions, from police advocates and probably from politicians. But police agencies are ultimately answerable to the communities they serve. If a city’s police leadership has adopted use of force policies that don’t conform with a community’s values, the community should demand new leadership. If the city’s politicians don’t comply, then the community should demand new politicians. Common Dreams has additional opinions here. The big questions regarding Freddie Gray were how he could sustain such lethal injuries while in police custody and why he was even arrested in the first place. 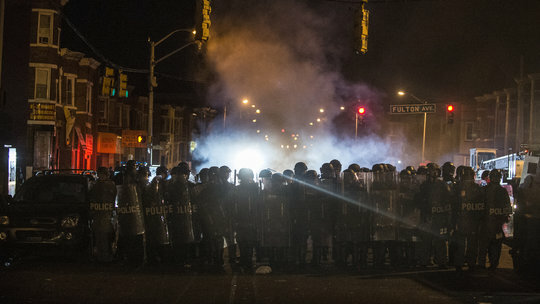 Fortunately there is no attempt in Baltimore to allow the police to avoid the justice system as in Ferguson. Prosecutors have charged six police officers for crimes including second degree murder and manslaughter in the death of Freddie Gray. His arrest was also called illegal with the police lacking probable cause to detain him. Gray has been criticized by conservatives (who tend to ignore the entire issue of abuses by the police) for running. In retrospect, it certainly is understandable why Gray would want to run from police. He also has a long history of arrests which have not led to convictions. The system is working far better in Baltimore than in so many other cities where the death of black men in police custody have been ignored. We also need to look closer at the causes of the recent violence in light of reports such as in this article which places the blame on the police. Plus Gray is not the first to be injured by police in such a “rough ride.” Charges against the police officers directly involved in Grays murder are a good first step, but further investigation of police practices is also necessary. These well-intended pleas strike me as the right answer to the wrong question. To understand the question, it’s worth remembering what, specifically, happened to Freddie Gray. An officer made eye contact with Gray. Gray, for unknown reasons, ran. The officer and his colleagues then detained Gray. They found him in possession of a switchblade. They arrested him while he yelled in pain. And then, within an hour, his spine was mostly severed. A week later, he was dead. What specifically was the crime here? What particular threat did Freddie Gray pose? Why is mere eye contact and then running worthy of detention at the hands of the state? Why is Freddie Gray dead? Plus, as was commonly discussed when Ferguson dominated the news, it is far too common for black men to be killed either when being apprehended by the police or when in custody. The complaint was filed Monday with the Missouri Office of Chief Disciplinary Counsel which handles attorney discipline in the state. It accuses McCulloch and assistants Kathi Alizadeh and Sheila Whirley of “gross failure to vigorously represent their client – the citizens of St. Louis, Missouri, in their capacity as prosecutors.” Alizadeh and Whirley were in charge of presenting the Wilson case to the grand jury. “We would like to send the message that prosecuting attorneys can no longer abuse their power and expect it to be swept under the rug,” said Christi Griffin, a former attorney who is the founder and president of the Ethics Project, and one of seven citizens to sign the complaint. Rule 4-3.3: Candor toward the tribunal. The complaint says, among other things, that Alizadeh and Whirley cited an outdated, unconstitutional use-of-force statute, and failed to properly correct their mistake. The two are also accused of knowingly allowing witnesses to lie to the grand jury. Rule 4-1.1: Competence. Historically, the plaintiff — or the person bringing the case — is supposed to receive the benefit of the doubt. In the Wilson case, the state is the plaintiff. The complaint alleges that Alizadeh and Whirley, presumably with McCulloch’s knowledge, did not do all they could to present the strongest case for the state. Rule 4-1.6: Confidentiality of information. The complaint says McCulloch needed permission to release the transcripts of grand jury testimony and witness statements and that he dumped all the evidence in an effort to taint a second grand jury. Rule 4-1.8: Conflict of interest: prohibited transactions. The complaint alleges that Alizadeh and Whirley acted more like Darren Wilson’s defense attorneys. They cite the continual references to the marijuana in Michael Brown’s system, and the fact that he was suspected of robbing a convenience store moments before the shooting. Rule 4-3.4: Fairness to opposing party and counsel. McCulloch made several public statements that seemed to bolster Wilson’s statements, while commenting negatively about Michael Brown. Rule 4-3.5: Impartiality and decorum of the tribunal. Alizadeh is accused of making comments about protesters, the NAACP and Ferguson unrest that could prejudice the grand jurors. Rule 4.4-1: Truthfulness in statements to others. This complaint also deals with the outdated use-of-force statute originally presented to the grand jury. It specifically references the day Alizadeh handed the copy of the unconstitutional statute to the grand jury, and also comments she made about messing up the exhibit numbers. Rule 4-5.2: Responsibilities of a subordinate lawyer. Alizadeh and Whirley were required to abide by the rules of professional conduct regardless of what McCulloch told them to do. Griffin said the availability of the transcripts and evidence, even though it was released in violation of the codes of conduct, brought to light problems with the entire judicial system. “It’s made possible by the prosecutors, because as long as the police can expect not to be prosecuted for their misconduct, they will continue to over-police, they will continue to abuse citizens, they will continue to use excessive force,” she said. There is speculation that this could result in the reopening of the case with a special prosecutor forming a new grand jury to reconsider indicting Darren Wilson for shooting Michael Brown when considerable evidence shows he was attempting to surrender. I am not very optimistic that there will be action on this letter. St. Louis Public Radio also reports that an attorney serving as a legal consultant “said he was unaware of any Missouri prosecutors who were ever publicly disciplined, even for what he said were pretty egregious violations.” On the other hand, the unprecedented level of publicity surrounding this case, and the considerable evidence of misconduct on Wilson’s part, including using witnesses who he knew were lying and giving incorrect instructions to the grand jury, could make it more difficult for Missouri officials to continue to sweep this killing by a police officer under the rug. There have been multiple irregularities in the grand jury proceedings regarding Darren Wilson, who shot Michael Brown when both eye witnesses and forensic evidence suggest he was attempting to surrender. The case was handled improperly in order to protect Wilson from facing a fair trial, with the prosecutor essentially acting as the defense for Darren Wilson. There were also irregularities in how the evidence was handled and in the directions given to members of the grand jury. Prosecutor Robert McCulloch has admitted to using testimony from people he knew were lying in defense of Wilson. The grand juror, referred to only as “Grand Juror Doe” in the lawsuit, takes issue with how McCulloch characterized the case. McCulloch released evidence presented to the grand jury and publicly discussed the case after the grand jury decided not to indict Wilson, then a Ferguson police officer, in the shooting death of Michael Brown, an 18-year-old African-American. “From [the grand juror]’s perspective, the investigation of Wilson had a stronger focus on the victim than in other cases presented to the grand jury,” the lawsuit states. Doe also believes the legal standards were conveyed in a “muddled” and “untimely” manner to the grand jury. In the lawsuit filed Monday in federal court, the American Civil Liberties Union of Missouri argues that this case is unique and that the usual reasons for requiring the jurors to maintain secrecy should not apply. In this specific case, “any interests furthered by maintaining grand jury secrecy are outweighed by the interests secured by the First Amendment,” the lawsuit says, adding that allowing the juror to speak would contribute to a discussion on race in America. As the grand juror points out in the lawsuit, the Wilson case was handled in a very different manner than other grand juries. Instead of recommending a charge, McCulloch’s office presented thousands of pages worth of evidence and testimony before the grand jury. At one point, McCulloch’s spokesman characterized the grand jury as co-investigators. “From [Doe]’s perspective, although the release of a large number of records provides an appearance of transparency, with heavy redactions and the absence of context, those records do not fully portray the proceedings before the grand jury,” the lawsuit says. Citations for traffic violations fell by 94 percent, from 10,069 to 587, during that time frame. Summonses for low-level offenses like public drinking and urination also plunged 94 percent — from 4,831 to 300. Even parking violations are way down, dropping by 92 percent, from 14,699 to 1,241. Drug arrests by cops assigned to the NYPD’s Organized Crime Control Bureau — which are part of the overall number — dropped by 84 percent, from 382 to 63. Policing quality doesn’t necessarily increase with policing quantity, as New York’s experience with stop-and-frisk demonstrated. Former Mayor Michael Bloomberg asserted that the controversial tactic of warrantless street searches “keeps New York City safe.” De Blasio ended the program soon after succeeding him, citing its discriminatory impact on black and Hispanic residents. Stop-and-frisk incidents plunged from 685,724 stops in 2011 to just 38,456 in the first three-quarters of 2014 as a result. If stop-and-frisk had caused the ongoing decline in New York’s crime rate, its near-absence would logically halt or even reverse that trend. But the city seems to be doing just fine without it: Crime rates are currently at two-decade lows, with homicide down 7 percent and robberies down 14 percent since 2013. The slowdown also challenges the fundamental tenets of broken-windows policing, a controversial strategy championed by NYPD Commissioner Bill Bratton. According to the theory, which first came to prominence in a 1982 article in The Atlantic, “quality-of-life” crimes like vandalism and vagrancy help normalize criminal behavior in neighborhoods and precede more violent offenses. Tackling these low-level offenses therefore helps prevent future ones. The theory’s critics dispute its effectiveness and contend that broken-windows policing simply criminalizes the young, the poor, and the homeless. Public drinking and urination may be unseemly, but they’re hardly threats to life, liberty, or public order. (The Post also noted a decline in drug arrests, but their comparison of 2013 and 2014 rates is misleading. The mayor’s office announced in November that police would stop making arrests for low-level marijuana possession and issue tickets instead. Even before the slowdown began, marijuana-related arrests had declined by 61 percent.) If the NYPD can safely cut arrests by two-thirds, why haven’t they done it before? The human implications of this question are immense. Fewer arrests for minor crimes logically means fewer people behind bars for minor crimes. Poorer would-be defendants benefit the most; three-quarters of those sitting in New York jails are only there because they can’t afford bail. Fewer New Yorkers will also be sent to Rikers Island, where endemic brutality against inmates has led to resignations, arrests, and an imminent federal civil-rights intervention over the past six months. A brush with the American criminal-justice system can be toxic for someone’s socioeconomic and physical health. Our prison population is now larger than those of the Soviet Union’s infamous Gulags, and the largest prison system in history. The statistics speak for themselves, revealing that the New York Police Department has been needlessly arresting people who were not criminals at all. Rather than bolstering their case, the NYPD has instead given Mayor Bill de Blasio proof that the department is indeed out of control, and not accountable to the people they are there to protect. Instead of the anticipated surge in criminal activity, the results of the work stoppage have shown that the police have been arresting needlessly, the result of strict EPA regulations causing a decades-long drop of crime across the city as well as elsewhere nationwide. The transition of the justice system from law enforcement to profit center was a slow one, but now it is near absolute. There have been whole towns which had police citations as their primary revenue source. Private prisons generate record revenue and have turned into a new form of slavery. This is made worse when you realize that most prisoners have never even been before a jury for trial. The NYPD is the largest police force in the United States. As a result, it is a good study for understanding what is wrong with American justice. By their work stoppage, the NYPD hoped to show how indispensable they are. Instead, ironically, it demonstrated that the department itself has been the problem the whole time. If we want to see crime drop in the largest city in the big apple, it is time for real reforms. Although it’s not the intended goal of the work stoppage, the decline in arrests could save New Yorkers money. The city residents who are normally hit with tickets for minor violations tend to be low income individuals who are forced to pay up a hefty portion of their paychecks. The city began following the broken-windows style of policing in the early 1980s, a strategy championed by NYPD Commissioner Bill Bratton which focuses on eliminating low-level crime to prevent more violent offenses in the city’s neighborhoods. But a report earlier this year by the John Jay College of Criminal Justice in Manhattan found that the NYPD’s practice of arresting more people for minor offenses since 1980 has disproportionately affected young black and Latino men. While de Blasio and Bratton have followed through on their promise to reform the city’s stop and frisk practices and the mayor announced in November that police would stop making arrests for low-level marijuana possessions, there are still racial biases in police practices throughout the city that result in a tougher financial burden on those already struggling to make ends meet. And New Yorkers of all income levels are also saving money on one of the most consistent ways the city can slam people with tickets— parking violations are down by 92 percent, from 14,699 to just 1,241 this year. NYPD officers have long spoken about quotas which require them to issue a certain number of summons per month to maintain statistics showing a reduction of crime in the city’s neighborhoods. Although Bratton promised an end to arrest quotas when he took office in January, the city’s police are still operating under a quota system which is illegal under state law, according to a recent report by the Police Reform Organizing Project. The group called on Bratton and de Blasio to end the quota system in its October report, which described how police are still using the quota system, as evidenced by the number of misdemeanor arrests and the poor quality of those arrests under Bratton. Even if we are inadvertently seeing some good outcomes for the wrong reasons, perhaps city governments will learn something here. Update: Steve M. has a different view from Matt Taibbi. Certain witnesses who spoke before the grand jury investigating the Aug. 9 shooting of Michael Brown told obvious lies under oath, St. Louis Prosecuting Attorney Robert McCulloch said Friday. “Clearly some were not telling the truth,” he said during an interview on KTRS 550. He added that he’s not planning to pursue charges against any lying witnesses. In his first extensive interview since the grand jury decided not to indict Ferguson Police Officer Darren Wilson, McCulloch said he had no regrets about letting grand jury members hear from non-credible witnesses. “Early on I decided that anyone who claimed to have witnessed anything would be presented to the grand jury,” McCulloch said. He added that he would’ve been criticized no matter his decision. During the interview, McCulloch referenced a woman who claimed to have seen the shooting. This “lady clearly wasn’t present,” McCulloch said. “She recounted a story right out of the newspaper,” backing up Wilson’s version of events. The criticism of that witness fits the questions surrounding Sandra McElroy, also known as Witness 40. McElroy, who’s admitted to using racial slurs and trying to raise money for Wilson, testified that she saw the entire shooting unfold, and that Brown charged the officer shortly before he was killed — a detail that has proven controversial because of conflicting reports. Investigators picked apart McElroy’s story, saying she could not have left the apartment complex in the way she described. She also gave conflicting accounts of why she was at the scene of the shooting that day and admitted that she has short-term memory problems from a head-on collision that left her with a traumatic brain injury. McCulloch’s acknowledgment that he knew some of the witness accounts were untrue raises ethical questions about his office’s presentation to the grand jury. I’m sure there will be more legal opinions to come regarding McCulloch’s actions. Internal Affairs is investigating the circumstances of an arrest, captured on video, that shows a plainclothes cop repeatedly punching a teen suspect in the body as three uniformed cops were trying to subdue and handcuff him, police said. Since the decision not to indict in Ferguson was released it seems like hardly a day goes by in which police shootings are not in the news. I noted this trend yesterday, and today there is a new story–a shooting of a man by police in Hollywood who had a knife in his pocket. As Think Progress notes, we do not yet know the full details of this situation, but it does appear to be part of a disturbing trend of police escalation of incidents both in Los Angeles and in other cities around the country. While details of Friday’s shooting are still emerging, officers seemed to have engaged in the same rapid escalation that has been criticized in other recent shootings. In St. Louis this past August, officers shot a man holding a knife less than 20 seconds after arriving at the convenience store where he had allegedly stolen two cans of soda. While police in Los Angeles, St. Louis, and New York City have long been criticized over their deployment of lethal force, Burlington, VT officers had not fired their guns on duty in 16 years when they killed a mentally ill man last November because he was brandishing a shovel. These clashes occupy a different category of police violence from the killings of unarmed black men that have sparked mass street protest around the country in recent months, such as the barehanded killing of Eric Garner by New York police who applied a prohibited chokehold while the 43-year-old said “I can’t breathe” repeatedly. Protests have also been inflamed by twelve-year-old Tamir Rice, who Cleveland police shot and killed for playing with a toy gun. The officers killed Rice so soon after getting to the scene that the driver of the car wasn’t even out of his cruiser yet. Officer Timothy Loehmann’s record of handling his weapon was so poor that a previous department had forced him to step down. Los Angeles police are also under scrutiny as the public awaits the release of autopsy results in the LAPD killing of Ezell Ford, an unarmed man who eyewitnesses say was laying on the ground when officers shot him this past summer. Ford was killed two days after officers in Ferguson, MO shot unarmed teenager Michael Brown. In each case, trained officers escalated the situation, and killed someone who might have been subdued another way. Police killings are notoriously difficult to track and analyze systematically because hundreds of them never get reported to official crime and violence databases maintained by the federal government. After all the attention paid to such incidents recently, one might think that the police would be trying to avoid the use of lethal force whenever possible. Instead it looks like the police might have picked up upon another lesson we have learned–it is very unlikely for police involved in shootings to be indicted or otherwise disciplined. This unfortunate trend continues. Following the grand jury decisions against indictments of police officers who killed Michael Brown in Feguson and Eric Garner in New York, a white police officer has shot an unarmed black man in Arizona. The only thing he was found to be carrying was a bottle of Oxycontin. A grand jury is now being impaneled in Brooklyn to investigate the killing of Akai Gurley, yet another unarmed black man who was killed by police. A Justice Department investigation found that the Cleveland police were too quick to use deadly force. The growing distrust between Cleveland police and the communities they serve can be attributed in part to how quickly officers draw their weapons without trying to use words to calm tense situations, according to the U.S. Department of Justice investigation of the Cleveland Division of Police. In addition to finding that police often fire their weapons recklessly, the report called out police for using deadly force or less lethal force as their first approach rather than a last resort, even in cases where a suspect is mentally disabled. “We…discovered that officers do not effectively de-escalate situations, either because they do not know how, or because they do not have an adequate understanding of the importance of de-escalating encounters before resorting to force whenever possible,” the report says. These practices have become routine in a police culture that encourages using force as punishment – a pattern that’s not only illegal but also puts a strain on police-citizen relations, according to the Justice Department. The law allows police to use deadly force when their lives or the lives of others around them are in danger, but the Justice officials slammed Cleveland police for shooting at or using other means of physical coercion against people who were not a threat. Why would we expect Cleveland to be any different from what is sure looking like a disturbing national trend? The Garner killing must lead to major changes in policy, particularly in the use of “broken windows” policing — a strategy in which Officer Pantaleo specialized, according to a report in September by WNYC, which found that he had made hundreds of arrests since joining the force in 2007, leading to at least 259 criminal cases, all but a fraction of those involving petty offenses. The department must find a better way to keep communities safe than aggressively hounding the sellers of loose cigarettes. And while defenders of the police like to point to thousands of nonfatal misdemeanor arrests as evidence that officers are acting in a way that is reasonable and safe, there can never be a justification for any lethal assault on an unarmed man, no justification for brutality. A Staten Island grand jury voted on Wednesday not to bring criminal charges in the death of Eric Garner, a black man who died after being placed in a chokehold by a white police officer, a decision that triggered outrage by many public officials, spurred protesters to take to the streets and led President Obama to once again vow to help heal the rift that exists between the police and those they serve. Mayor Bill de Blasio, speaking at a news conference in Staten Island, said that he had been assured by Attorney General Eric Holder that a federal investigation would continue to probe the death and determine whether Mr. Garner’s civil rights were violated. The grand jury decision was reached after months of testimony, including that provided by the officer who used the chokehold, Daniel Pantaleo. The grand jury reached its decision less than two weeks after a grand jury in Ferguson, Mo., declined to bring charges against a white officer who fatally shot an unarmed black teenager, Michael Brown. An autopsy by the city’s medical examiner found that Mr. Garner’s death was a homicide resulting from the chokehold and the compression of his chest by police officers. Video of the event is above in which Eric Garner can be heard saying more than once that he could not breathe. To analyze the accuracy of the FBI data, the Journal requested internal records on killings by officers from the nation’s 110 largest police departments. One-hundred-five of them provided figures. Those internal figures show at least 1,800 police killings in those 105 departments between 2007 and 2012, about 45% more than the FBI’s tally for justifiable homicides in those departments’ jurisdictions, which was 1,242, according to the Journal’s analysis. Nearly all police killings are deemed by the departments or other authorities to be justifiable. The full national scope of the underreporting can’t be quantified. In the period analyzed by the Journal, 753 police entities reported about 2,400 killings by police. The large majority of the nation’s roughly 18,000 law-enforcement agencies didn’t report any. American police kill many, many more citizens than officers in similar countries around the world. The number of people killed by police in many countries in a year is in the single digits. For instance, in Britain (where most officers don’t even carry guns), police fatally shot zero people in 2013 and one person in 2012. Germany has one-quarter the population of the United States, and police there killed only six people in all of 2011. Although official figures put the number killed by American police each year around 400, the true number may be closer to 1,000. The most common explanation is that since we have so many guns in America, police are under greater threat than other police. Which is true, but American police also kill unarmed people all the time — people who have a knife or a stick, or who are just acting erratically. There are mentally disturbed people in other countries, too, so why is it that police in Germany or France or Britain or Japan manage to deal with these threats without killing the suspect? This is where we get to the particular American police ideology, which says that any threat to an officer’s safety, even an unlikely one, can and often should be met with deadly force. We see it again and again: Someone is brandishing a knife; the cops arrive; he takes a step toward them, and they fire. Since Brown’s death, at least 14 teenagers have been shot and killed by police; the weapons they were wielding included knives, cars and a power drill, all of which can be obtained by European citizens, at least as far as I know. In the case of Michael Brown the killing was justified by claims that Brown had grabbed Darren Wilson’s gun (with much of the physical evidence and eye witness testimony putting this claim in question). We can see what happened in the killing of Eric Garner in the video above and there is no sign whatsoever that the police had reason to feel threatened.